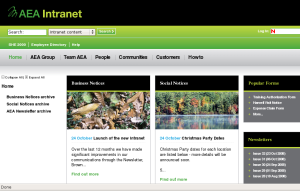 Today we put live the new Intranet at AEA which has been Kat’s major project (should get to spend more time with her now its launched!) with some support from me and impressive efforts from the dev team. 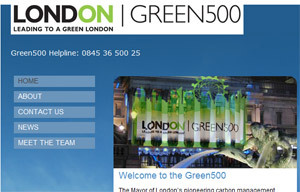 Previously we had a static HTML Intranet which wasn’t really serving the needs of the business as well as it could. The new site is based on the AEA Framework – which I’ve blogged about a bit before. Essentially an extension of the Zend Framework glueing Silverstripe and other 3rd party components together with a single sign on approach (in this case we are also using LDAP to do logins from our current Novell infrastructure). We built on our HTML content crawler tool to hoover in the static HTML into the Content Management System. I’ve also had some exciting news this week which I will share when I can. MediaWiki is brilliant! Oh and so is FishEye! If you are looking for Wiki software (and don’t have the budget for Confluence – which looks very nice indeed) then check it out – mega easy to install and dead easy to use once you install the FCKeditor plugin (as Wiki text can be a bit of a barrier to adoption). 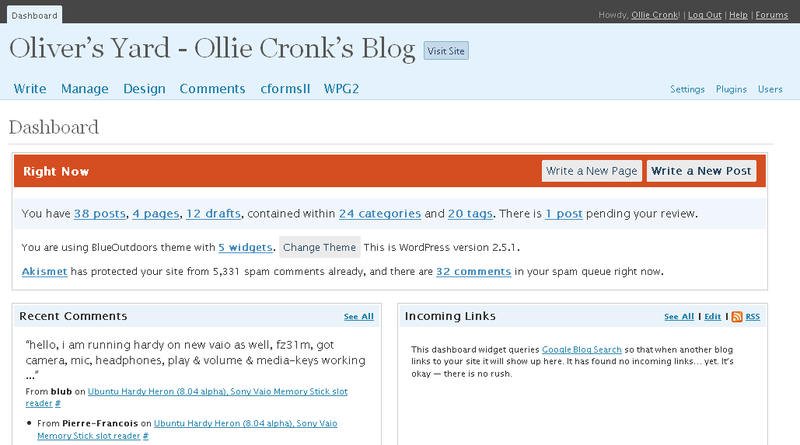 Update: We have now gone for Vanilla forum which is really nice. PHP4 but has a really nice interface, next step Framework integration! 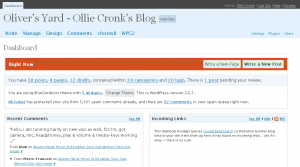 This is more for notes to myself for now – that I installed bbPress (by the same developers as WordPress that this blog runs on) and Phorum 5. To see if they are any good / worth using at work (eg will they integrate well with other web tools/the Zend/AEA Framework, how well are they written and documented, whats the licensing etc). This integrates quite nicely with WordPress (uses the same users) would be good if it could use more of the WordPress installation stuff (eg templating). Also has a nice Poll plugin (although code for this looks a bit hacky). Cons: PHP4 based, Doesn’t look very mature from its version number, GPL license might cause issues when integrating. Particularly interested in this one as it looks good / feature rich but it is also BSD licensed making it more flexible to customise and incorporate into other frameworks without having to re-release an Open Source version. Cons: Again PHP 4 based. Recently re-worked the website I put together for LSA Ltd: www.travelf1.com to allow for easier updates by Lynden and the team. It now uses Silverstripe 2.2.1 – an excellent open source Content Management System (we are using it extensively at work for “brochureware” – or sites that would otherwise be static HTML files – put together in Dreamweaver or similar). Check it out if you are looking for a CMS – has some great features for both the end administrator (nice visual interface) and the developer (uses PHP5 and MVC).